Oops - we don't appear to have a video for the fi-5900C. We are delighted with the Fujitsu Fi-5900C scanner. We definitely give it 5 out of 5 for performance. Also thanks for the excellent service and support during our trial period. I'd definitely recommend you guys. The Fujitsu Fi-5900C document management scanner from Fujitsu provides users with a multifunctional, high quality image processing mid-volume scanner aimed at applications with scanning requirements up to 100,000 documents per day. 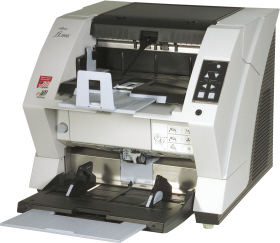 The Fi-5900C can scan in colour and mono at speeds of 100 pages per minute at 200 dpi through the 500 sheet automatic document feeder which can accomodate all paper sizes between A8 and A3 and also has manual feed capability. Based on extensive user feedback, the Fi-5900C incorporates a wealth of new new features aimed at streamlining the scanning function. 100% straight paper path in the image capture area. Handles mixed batches, where 'mixed' means quality, size and paper weight can vary significantly. Easy feeding of differnet volume batches due to height adjustable input hopper. Variable alignment of input hopper, left, right or center aligned. Multi Zoned ultrasonic multi feed detection. Scan in Mono, Greyscale or colour at the same speed (upto 200dpi). Multi Stream output, deliver colour and mono images at the same time. Extra wide CCDs eliminate cut corners on skewed pages. Continuous, almost uniterrupted scanning due to on-the fly calibration. Blank page detection and discarding. Supplied with Hardware VRS 4.0 Plus. Active Stacker ensure batches are easily and neatly handled. Full support for 8 major languages, drivers manual and front panel. Low noise operation < 55dB. Easy cleaning access to all consumable and paper path areas.